I just watched one of the most disappointing football games in recent memory. Now, before I go on, I want you to know that this post isn't about football. It's about winning. It's about finishing. It's about staying tough to the finish. It's about never giving up. But I just watched the Green Bay Packers blow a 16-0 lead; by the 4th quarter, it was 16-9. Then the wheels came off the bus. An on-side kick bounced off one of the Packer player's helmet and the ball passed through his hands. 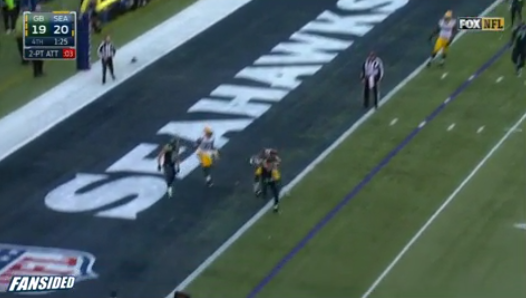 A Seahawks player scooped up the ball and took possession. A few plays and a TD later, Russell Wilson passed the ball into the end zone for the extra points. A Packers defender, who had 2 interceptions earlier in the game, let the ball go by and the Seahawks scored on the 2 point conversion. The Packers, who had played so well the first 3 quarters, made it look so easy for the Seahawks to score and take control of the game.. It felt like the Packers just had given up by the 4th quarter. I don't know. Maybe they used up all that they had the first 3 quarters and couldn't bring it for 15 more minutes? HaHa Clinton-Dix missing the interception...who's laughing now? I'm a native Chicagoan, and I follow the Bears. I can tell you that as a Chicago fan (baseball and football), I'm used to disappointment. This game was more reminiscent of a Bears game than a Packers game. But I'm also a closet Packers fan. 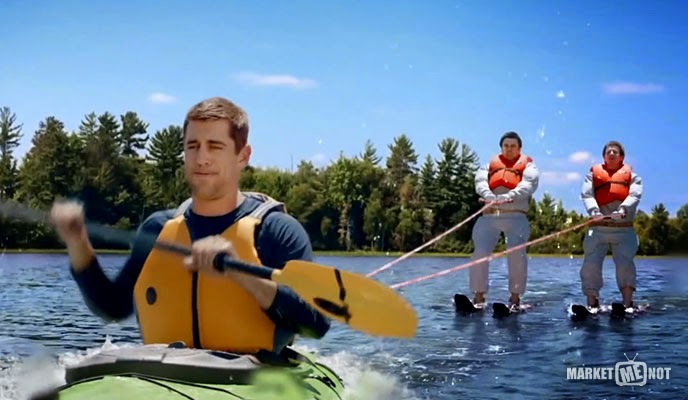 I know we're supposed to be mortal enemies--Bears and Packers. My son is a huge GB fan and so I've been along for the ride. I've been to Lambeau Field way more than I've ever been to Soldier Field. (The things we do for our kids!) The Packers are a fun team to watch. Aaron Rodgers was my fantasy QB last year, and I won the whole thing. I love his Discount Double Check Commercials. Today's game was a shocker. Watching the players on the sidelines, it didn't even seem that they were affected by the reversal of fortune. We even joked that maybe the players got their paycheck from the Seahawks right before the 4th quarter, because it sure looked like they threw the game. "Row, row, row your boat, down the loser stream..."
Do you think that really happens in professional sports? I mean, those conspiracy theories always come up when a really good team loses. Maybe it happens in running too. We already have athletes in all sports using banned substances, all in the name of winning. But what about a team throwing a game? A runner throwing a race? Does it happen? Would someone do it, for money? I do realize that there is a difference between team sports and individual achievement. Which makes this loss all the more puzzling. What about pride? What about knowing that you gave your best, even though the outcome wasn't a win? I've heard of runners quitting a race before the finish line (Ryan Hall), realizing they're not going to make their goal time, whatever their excuse might be. Heck, I've been there--tempted to quit more than once. 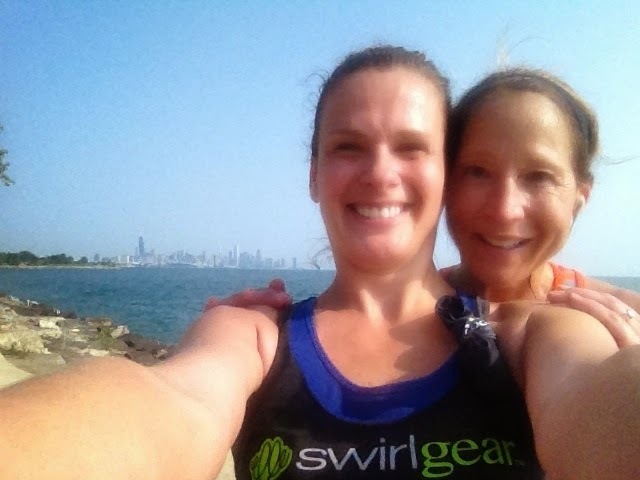 My first Chicago marathon? I hit the wall at mile 14. I can tell you how hard those last 12 miles were for me, knowing that I was not going to make even close to my goal time. I may have even called my husband at mile 18 to come pick me up. And he may even have told me to keep walking. Which I did. And there was last summer's Zooma race, where I felt awful starting at mile 4 and ready to quit at the 10k mark. But a dear friend came back to find me and ran with me for the rest of the race, making sure I crossed that finish line. That was a victory of a different sort, and one I will cherish forever. Don't let that smile fool you. I was miserable. This girl got me to the finish line! I didn't quit. I finished. In both cases, it wasn't pretty, but I got it done. There's a certain pride in pushing through the pain and crossing that finish line! Not in the moment of course, but I'm so proud to look back and say I've never DNF'd a race. Of course, I'm not a professional athlete, and there's no money involved, unless you count my race entry fee. And I will admit, I do like getting that medal placed around my neck! And so I ask you, if you trained for a race, crossed the start line, and then started to realize this wasn't going to be your race, would you quit? Or would you change your strategy? Maybe walking more than you wanted? But crossing that finish line, no matter what? What would bring you to the breaking point? Maybe instead of focusing on the failure of the Packers, I should be praising the Seahawks. Because they are the team that never gave up, even with that huge deficit and a less than stellar performance from their QB (hello, 4 interceptions?) But they believed they could and they did (I can and I will!). They capitalized on mistakes by the Packers in that last quarter and pulled out an improbable win. THAT is what I'm talking about. Believe and you can achieve. And never, ever give up. I think a lot depends on why it wasn't going to be "your day" - I kept pushing training and finished a race, (unknowingly) injured, when I should have DNF'd and have been paying for it for over a decade. Not worth it. That experience made me stop training and get help faster the last time, as well as readjust my race plans. Now I try to keep in mind do no harm, do nothing that risks my running long-term. A lead doesn't mean anything if you can't finish. I have a friend who is a Packers fan, and I'll probably see him today. I can't imagine how he's feeling today. A good lesson for all of us! Interesting perspective! I certainly hope that the Packers didn't throw the game on purpose. But who knows what really happens. Definitely made for an interesting game and lots of viewers I'm sure had the tv on! I think that your acheivements and stories are amazing and they make up the runner that you are. Can't win them all right? No, but wouldn't we all like to? Is it bad I didn't watch any football yesterday? The only thing football related that I'm passionate about it my distaste for Jay Cutler. How he got the contract he has I will never know. As for finishing a race. except for Chi 10 when I wanted to quit at mile 9, I never entertained the thought of quitting entirely. I've had DNS but knock wood, no DNFs. Kudos to you for pushing through! No, I would not quit. I've had some pretty awful races and just kept moving, having to walk due to cramps, etc. Granted, not marathons, but I can't imagine not finishing what I start, regardless of time. The swag wagon would have to forcefully take me, kicking and screaming. 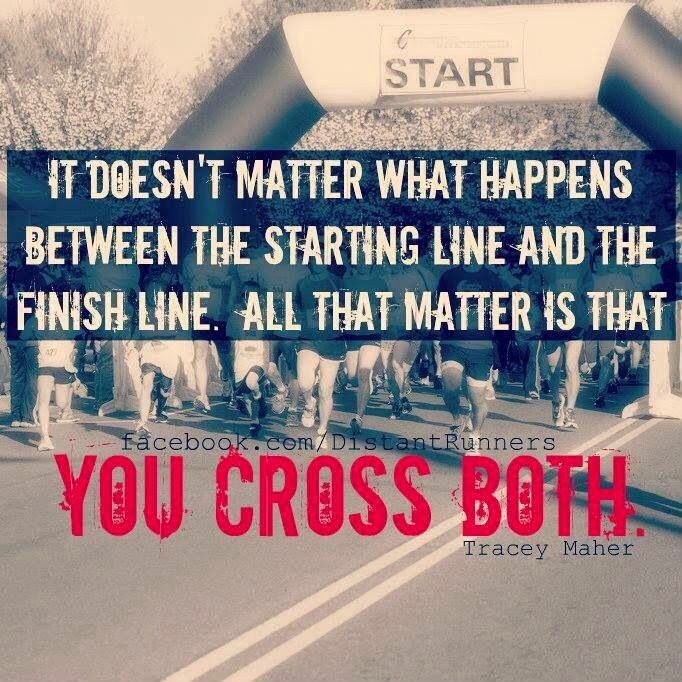 I'm with you...whatever it takes to cross the finish line! This was totally me at my fall marathon. I felt like crap at mile 15, ran as much as I could after that and walked when I couldn't, all to cross the finish line. It's one thing to stop because you don't want to get injured, but it's another to give up just because you're not performing as well as you'd like. Finishing under those circumstances builds character! I am a fan no matter what, but it was just hard to watch. I hope they didn't throw it on purpose, but it was just wasn't normal Pack playing. SO sad. The ending was so bizarre and unPacker-like! It was such a tough loss for the Packers, but such a glorious victory for the Seahawks; crazy how that happens, right? You bring up a great point, though; it's all about perseverance, win or lose. I love the racing comparison; great post, Wendy! Thanks so much for joining the link up again this week; hope you have a great one! Thanks Tara! I love trying to come up with something for your link up! you never know what the game or the race may bring. Perseverance is what keeps us coming back to race again every time right? Great post! I kind of felt this way during MCM when I hit the wall. I knew it wasn't going to be great but I didn't quit and I'm so glad I didn't! There's no better feeling than crossing the finish line! Even if it's just to be done. I was on my way back from my race and was listening to this game on the radio. I couldn't believe what was happening. Very unlike the packers to just give up. Yet it sounded like they had nothing left to give. There is nothing better than the feeling of overcoming those challenges. At the time, it would be so much easier to give up. But what kind of feeling is that?